DON’T STARVE will be arriving to retail for PlayStation 4 and Xbox One on Tuesday, April 17 in North America, and Friday, April 20 in Europe for £24.99. The Don’t Starve Mega Pack also includes a custom controller skin, featuring high quality, full-colour art of the distinctive creatures and inhabitants from the beloved franchise. In Don't Starve, players take on the role of Wilson - a Gentleman Scientist who is trapped in a mysterious world by a demon – and must learn to exploit their environment and its inhabitants in order to return home. Contending against randomly generated worlds filled with dark and eccentric visuals and a full range of environmental hazards that only a full year of seasons can bring. To survive, players must explore the world to discover its’ mysteries, gather a variety of resources and craft items and structures that match their survival style - all without instructions, help or hand-holding. Console survivalists will receive exclusive features such as split-screen local co-op so they can grab a controller with a friend and explore the depths of the wild together without connecting online. Set sail and head to the tropical high seas with Wilson who has found himself in troubled waters. 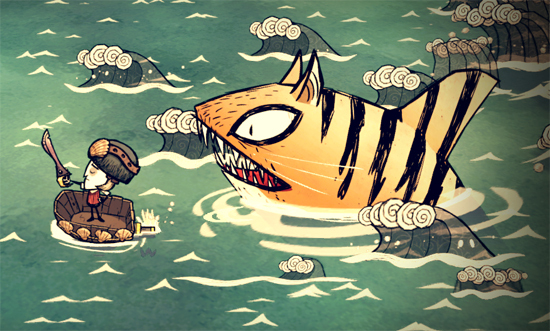 This fully animated theme from Don't Starve: Shipwrecked is scored with official music and drawn in the game's signature style. Wilson survives in Autumn in this animated theme from Don't Starve. Scored with official music and drawn in the game's signature style. The Don’t Starve Mega Pack will be available for purchase at major retailers, including Amazon and Game for £24.99.